Which of the following diagrams best depicts the relationship among Doctors, Lawyers and Professionals? Doctors and lawyers are entirely different. But, both are Professionals. Which of the following diagrams best depicts the relationship among Water, Atmosphere and Hydrogen? Hydrogen is a constituent of both Water and Atmosphere. Water is present in Atmosphere. Which of the following diagrams best depicts the relationship among Tie, Shirt and Shoe? Tie, Shirt and Shoe are all separate items, entirely different from each other. Which of the following diagrams best depicts the relationship among Book, Dictionary and Printer? 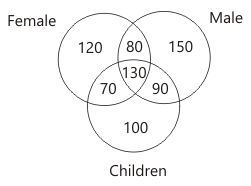 The diagram shows the survey on sample of 500 persons with reference to the number of males, females and children. 90 represents the group of which of the following persons ? 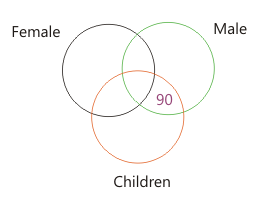 90 represent the number of persons who are both males and children.